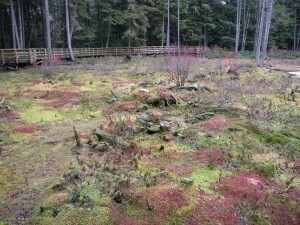 The morphology of the species in the class Sphagnopsida, also known commonly as “Peat moss”, is quite different from that seen in the other classes of the phylum Bryophyta. These morphological differences may explain why this class is the most economically valuable class of mosses. 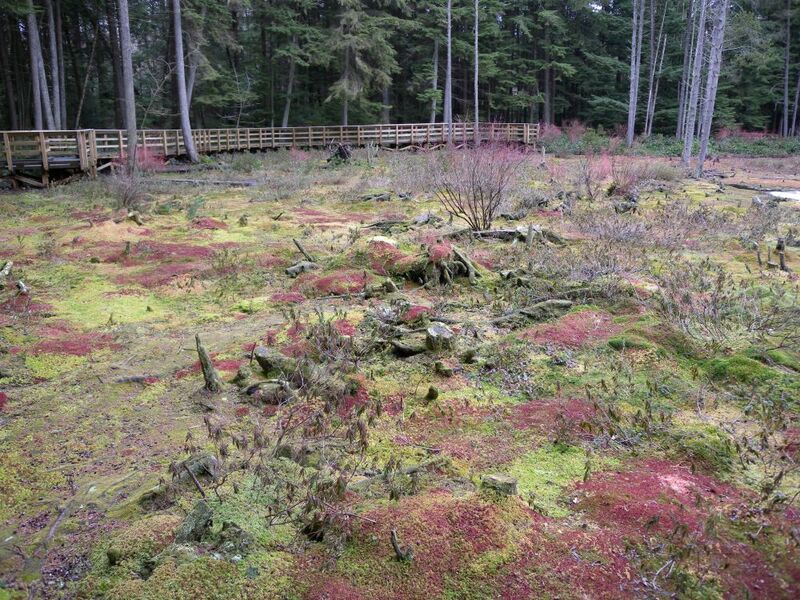 Not only is Sphagnum used in soil to increase water retention and horticulture, but it has also been used to dress wounds to prevent infection caused by microbes. In the class Sphagnopsida, there are two orders; Sphagnales and Ambuchananiales. While Sphagnum dominates cool humid climates, showing the greatest diversity in temperate regions, the order Ambuchananiales is only represented by one endemic species in two localities in Tasmania. The gametophyte of Sphagnum has two types of branches; pendant and divergent. The pendant branches hang down along the stem, which aid in the capillary movement of water, while the divergent branches stick out from the stem at about a 90 degree angle. A fascicle comprises of both the pendent and divergent branches that emerge from the same point on the stem. 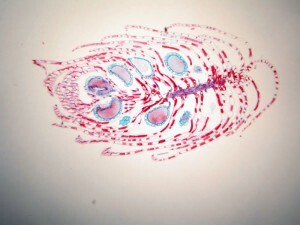 The capitulum, which is a cluster of young developing fascicles, is located at the apex of the main shoot. As the stem continues to elongate, new clusters of branches form at the apex, thus maintaining the capitulum. Furthermore, the protonemal stage of Sphagnum is very brief and filamentous, and is quickly followed by a thalloid stage. The species exhibit rhizoids only when the gametophyte is young. When looking at Sphagnum, one must remember to observe both the leaves of the stem and those of the branches because the leaf shape and cell arrangement will differ. These observations are extremely important when trying to key Sphagnum species. The leaves of the class Sphagnopsida are one cell thick (unistratose), arranged spirally and lack costa. Furthermore, the leaf tissue are characterized by being comprised of two cell types; chlorophyllose cells and hyaline (colorless) cells. The chlorophyllose cells, as the name suggests, possess chloroplasts and they form a network pattern in the leaves. The hyaline cells are dead at maturity and have one or more pores, which function to retain water and allows access to the environment. The structure of the hyaline cells is strengthened by fibrils, which are thickenings of the cell walls. 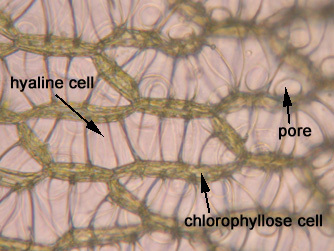 The arrangement of the chlorophyllose cells as well as the variations in the pore distribution seen in the hyaline cells provide useful information when classifying species in this class. 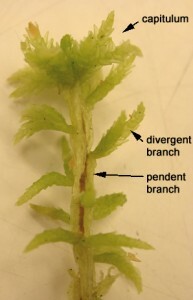 A cross section of a branch leaf can also be very useful in identifying a Sphagnum species. When observed carefully, one can see there is variation in how chlorophyllose cells are exposed. 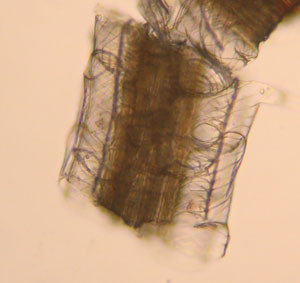 In some species the chlorophyllose cells are completely enclosed, while in others they can either be exposed more broadly on the concave surface (inner), the convex surface (outer) or equally exposed on both surfaces. Furthermore, the inner cell walls of the hyaline cells can further aid in the identification. 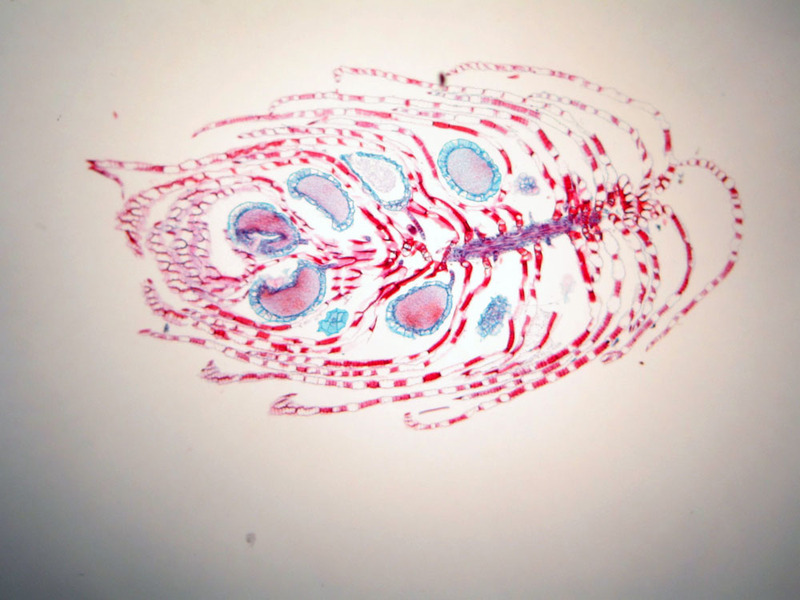 Seen here in this picture is a branch leaf cross section of Sphagnum papillosum, demonstrating the papillae on the cell walls adjacent to the cholorophyllose cells. The stem leaves tend to fold down, with the apex of the leaves pointing away from the apex of the stem. A closer look at the stem leaves will reveal that they have a tapered tip and an expanded base. Furthermore, chlorophyllose and hyaline cells are present, however it is worth noting that both these cells lack chlorophyll when mature. In some species, the presence of thickenings can be seen in the hyaline cells, giving the appearance that the cells are “divided”. The central part of the stem has a cylinder that is called a “wood”. The outer layer of the stem, also referred to as the cortex, is also composed of hyaline cells, which are called cortical cells. In some species, the hyaline cells may have pores and fibrils present. Species in the class Sphagnopsida do not have hydroids or leptoids. The perichaetial branches of the Sphagnum species are initially at the apex of the main stem, where the cluster of branches are found. Per each perichaetium, one can find multiple archegonia, however paraphyses are absent. The perigonial branches, which are modified divergent branches, can easily be identified because the tips are often tinged red. Per each perigonial leaf there is only one antheridia, which is located at the leaf’s axil, and paraphyses are absent. The antheridia are nearly globose and have a stalk, as seen in this picture. 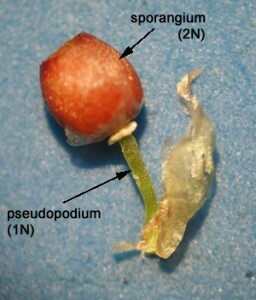 The sporangia of Sphagnum are similar to some extent to those seen in Bryopsida and Polytrichopsida in that an operculum is shed prior to the spores being dispersed. However, unlike these classes, Sphagnum species lack peristome. Furthermore, the sporangia in Sphagnopsida are elevated by a pseudopodium rather than by a seta. As seen in the liverworts, the stalk do not elongate until the sporangium has reached maturity. 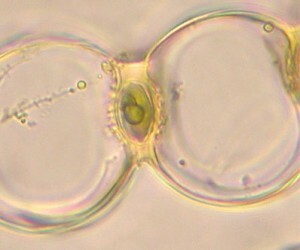 The sporangia in this class are round in shape and are often short-lived. 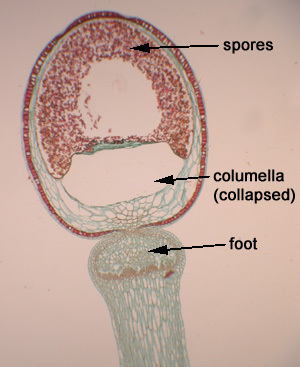 When the sporangium reaches maturity and the spores are ready to be shed, the columella (which is globose in Sphagnum) begins to degrade. The sporangial wall of the capsule then begins to constrict which causes the pressure inside the sporangium to increase. This pressure continues to build until it causes the operculum to be shed explosively, resulting in the spores being dispersed all at once. Some species in Sphagnopsida can reproduce asexually via fragmentation. It is worth noting however that this class does not have gemmae.